Silverstone Auctions will be holding its annual Race Retro & Classic Car Sale at Stoneleigh next month and one of the featured vehicles on the block will be an iconic 1962 Routemaster double-decker bus, one of the red two-story buses that became the symbol of London. When people think of London, England, they think of Big Ben, black cabs, and red double-decker buses. One of the earliest of those was the Leyland Routemaster, which dominated London's public transportation in the 1960s and 70s. 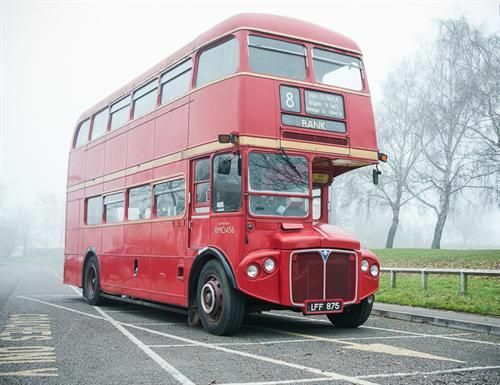 At the annual Race Retro & Classic Car Sale in Stoneleigh on February 23, Silverstone Auctions will be offering an original 1962 model Leyland Routemaster red double-decker with an estimated value between 20 and 28 thousand British Pounds ($32,000 to $44,900 USD). The bus is a slight departure from the norm for the Silverstone event, which focuses mainly on classic and race cars, but is expected to draw attention from around the globe thanks to this most iconic of London transportation pieces. "It might not be as fast or as sleek as some of the cars on offer, but it provides just as much fun and a great investment opportunity," said Nick Whale, Silverstone Auctions managing director. The Leyland Routemaster features an open-platform design, making it one of the first of London's large public transportation vehicles to not require a conductor. This design sped up boarding and unloading times and increased security thanks to higher visibility throughout the bus' interior. In addition to the innovative interior design of the bus, Leyland invested heavy research into lightweighting to trim down the Routemaster's bulk. This resulted in a vehicle in 1962 that achieved better fuel economy than do many comparably-sized buses even today. It was also one of the first vehicles of its kind to offer both power steering and an atuomatic gearbox, which lowered driver stress and reduced fatigue and accidents. This particular 1962 model saw service on London's roads as Royal Motor Carriage 1456 starting in July of 1962. It continued in service for much longer than usual, remaining in the fleet even after the 1994 privatization of London Transport. In fact, it was part of the Stagecoach fleet after that through to 2003, when it was finally sold into private preservation. It's current color and paint scheme are from its former route on the X15 Beckton Express in London, a commuter route begun in 1989. The bus' current owner has used the machine for occasional weekend and holiday trips, saying it has performed very well despite its age. Someone will acquire themselves an iconic piece of London's history on February 24th when this bus sells. We want to buy 1962 Leyland Routemaster double decker bus. Let us know the best price of this bus. Thanks for your reply. We want to buy 1962 Leyland Routemaster double-decker bus. Let me know the bus' price and How can we buy it from you ? Thanks for your reply.